Terriers dropped two spots to #6 in the USCHO weekly poll and one spot to #5 in the USA Today/USA Hockey Magazine weekly poll. Bobo Carpenter, Charlie McAvoy and Clayton Keller all were named to Hockey East’s weekly list of top performers. Carpenter (photo) extended his scoring streak to seven games with two goals and an assist, Keller had five points for the week and McAvoy had multi-point games in the contests against New Hampshire. Three days after Cade Webber’s verbal, BU received a commitment from another top ’01 defensive prospect, Alex Vlasic from the Chicago Mission 16U squad. The 6’4”, 182 lb., left-shot from Wilmette, Illinois, now in his third season with the Chicago Mission organization, has a 4-9-13 line in 19 games playing in the High Performance Hockey League. College Hockey Inc lists him as arriving at BU in 2020. Vlasic becomes the fourth ’01 defenseman committed to BU, joining Webber (The Rivers School), Braden Doyle (Lawrence Academy) and Case McCarthy (Junior Sabres 16U). All four played in last summer’s USA Hockey Select 15 Festival. McCarthy earned an A+ rating from USHR and the other three earned an A rating. All are considered strong candidates to be invited to next month’s NTDP Evaluation Camp. NHL.com’s Mike Morreale talks with former Terrier and current Devils head coach John Hynes about his path to the NHL. Terriers closed out the regular season with a 5-0 win against Maine at Walter Brown Arena. Backing Victoria Hanson’s 35-save effort, BU received two goals from Rebecca Leslie and one each from Mary Parker, Victoria Bach and Samantha Sutherland. 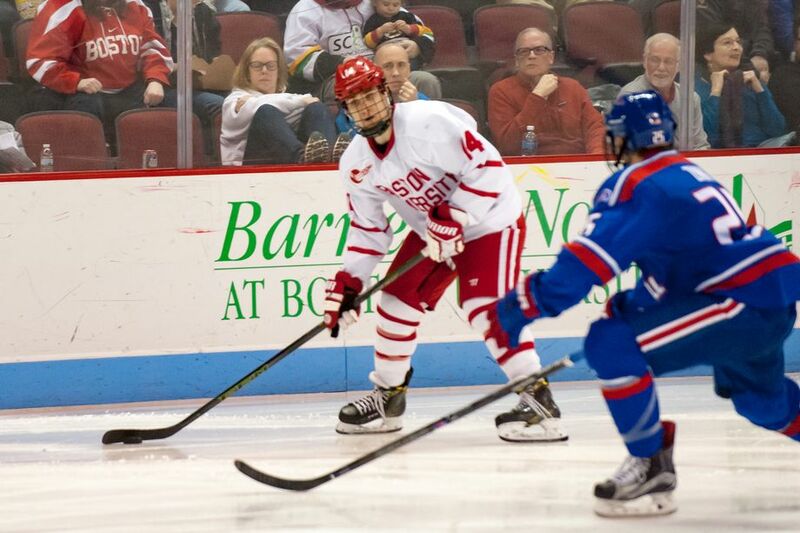 With the win, BU clinched the third seed in the Hockey East tournament and will host New Hampshire in a best-of-three quarterfinal series beginning Friday. If the Terriers advance, they’ll continue to play at home as WBA is the site of the semifinals and final this season. 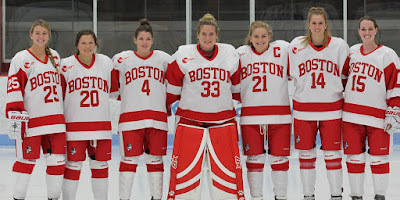 Prior to the game six seniors—Alexis Crossley, Samantha Sutherland, Sarah Steele, Victoria Hanson, Natalie Flynn, Maddie Elia—and grad student Parker were honored. Bach claimed the overall scoring title (47 points) and the conference scoring title (35) while Parker tied for the overall goal-scoring lead with 23.